Star Wars Battlefront II is just around the corner and opinions on the upcoming title are a plenty. Some are incredibly excited to see the new characters front and center with the promised story line, others can't seem to shake the overabundant reliance on EA's microtransaction policy. Even though EA did change a few of their loot crate mechanics after their beta's backlash, there is still a ton of set ups that encourage the pay-to-win mentality. When EA took to Reddit to respond to the critique, Reddit responded in kind: by making it the most down-voted comment in Reddit history. Electronic Arts took to the popular forum site to try and assuage the negative waves of feedback that have been completely overshadowing the title's release and it immediately backfired with fans demanding refunds or flat out boycotting the series as a whole. Immediately the backslash followed and record breaking responses ensued. "Hutt contracts and their rewards were a sense of pride and accomplishment. Various account level races and trooper skins were a sense of accomplishment. Locking iconic characters behind credit walls that will take dozens of hours to get one is just insane, especially when I am willing to bet you have tons of heroes planned which will be behind similar paywalls? You cannot ever attain a sense of pride and accomplishment from that, because most sane people will give up long before this." 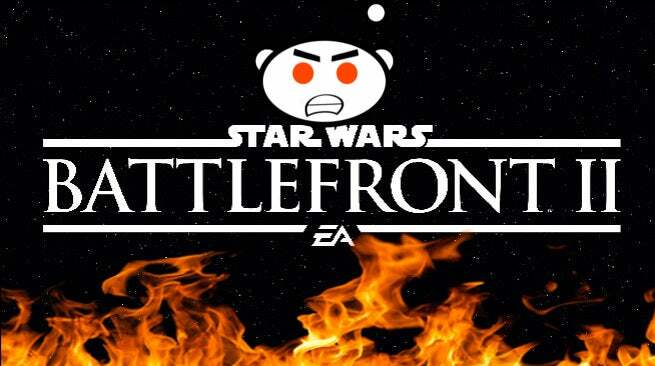 Others took the incredible amount of downvotes to make a point while telling EA that their actions and the way they've handled not only Battlefront but many recent titles makes it seem like they just don't care about their consumers,"UPDATE: We have taken your +300k downvotes into consideration. After some discussion, we have determined that your feedback doesn't matter." To read the full list of responses, you can see the (now locked) thread here. With the response making even more waves than they intended, it is unclear what the next step will be for EA and their upcoming title. So far they have given no indication that they are aware of the gravity of feedback. Until then, Star Wars Battlefront II releases on Xbox One, PlayStation 4, and PC on November 17th.